The Boho Hobos: The Best Spot (At This Park) EVER!!! Alright so here’s the deal: we moved to a new spot. We’re still in the same park, but my friend alerted me that the spot across the street from her, was open. She really wanted it, but since they’re leaving in 3 weeks, she didn’t think it was worth packing up and moving just 10 feet across the street. I honestly didn’t believe it was really open, lol! We took a walk over there and sure enough, no one was there. This is seriously the best site in the park because it has no neighbors to the right (for an acre or so…then there’s a mobile home), and to the left, there’s a parking spot for 2 trucks…a fence, then the next site. They’ve been having electrical issues with that other site though, so it’s rarely occupied. Basically, there’s no one to the left or right, I get a HUGE yard for the girls and Mojo to run around in, there’s an enormous tree right next to the RV that is absolutely PERFECT for climbing, AND we’ll be just a few feet away from our new friends. I figured it was too good to be true, but I called the manager anyways. He said if I wanted it, it was mine. I couldn’t believe it. I shouted “Yes!” (probably deafening him), thanked him and called Nic immediately. I interrupted his fishing, told him to get home ASAP and let him know that the second he does, we’re packing up, and moving to the primo spot on the edge of the park with the big yard and tree. He was a little reluctant, but appeased me anyhow. 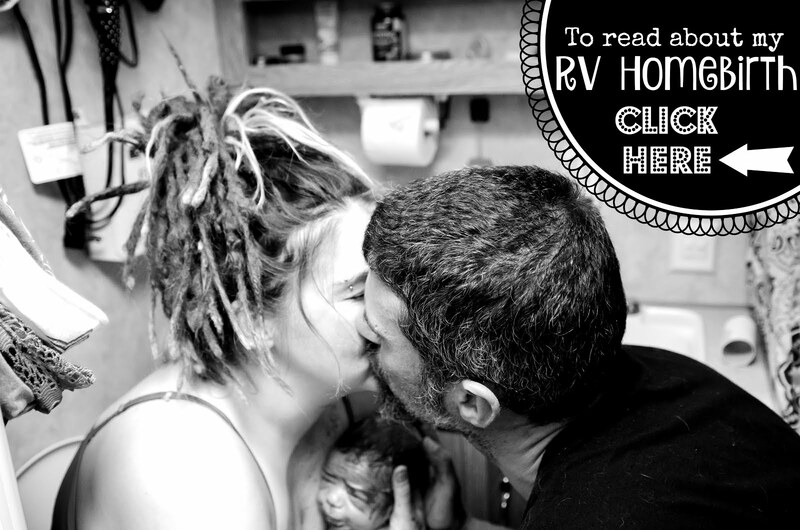 We had the RV packed up inside and out in under 30 minutes, and hauled her over to the new site. It’s so big, that we pulled straight in, unhitched, pulled the truck around through our yard, and parked it next to our rig. In a few minutes, we had everything back to normal and made our way outside. It didn’t take long for our new spot to feel like home…especially after I got all the lights hung back up the following day. Here’s some pics of our new setup. They seriously do NOT do this site justice, but they’ll hafta do for now. Future posts are sure to take place outdoors a lot, so you’ll see more of our site then. With all our new found room to stretch out, I’m sure we’ll be outdoors most of the time. This kind of gives you an idea how big the huge Cottonwood tree is. We measured it at its BASE, and it’s 30 feet around!!! Standing in our “Forest” that is just beyond our yard. It needs a hammock and a sheet teepee fort, methinks. The girls have so much playing tag while running through the trees. Standing off to the right of our RV. Our yard wraps around to the nose of our RV as well. It’s a great place to set up a game of Horseshoes with our buddies. Same standing spot, panning left, watching the girls run around. This picture looks out our dining room window. We have 2 parking spots. Off in the distance, there’s an unoccupied RV that belongs to one of the park’s employees, she’s a really nice lady. A real go-getter! It’s nice to look out my Kitchen window and not see the side of someone else’s RV. No complaints here folks (other than I really need to clean my windows, haha). Yes, even Mommy and Daddy have gotten their butts up there! The tree beckons you to climb it, I swear! I feel like I should be playing some awesome song while showing you our tree climbing expeditions, lol. Something by the Black Keys perhaps. Anywho, that just about sums up how happy we are with our new site. We’re going to be here for a WHILE (at least December…probably longer), so at least we’ll be really comfortable in the meantime. It does set the bar pretty high for anywhere we go in the future though…but that’s a first world problem that I’ll happily embark on when the time comes. Until next time, thanks for keeping tabs on us!